Clinical psychologist Chris Mackey presents some of the benefits of having Attention Deficit and Hyperactivity Disorder or ADHD. 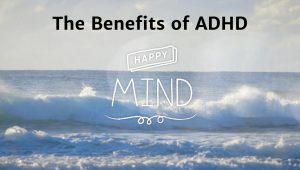 ADHD can, at times, negatively impact on people’s learning, well being and relationships. However those with ADHD will often have other strengths such as being more creative or intuitive that they can harness in other ways. Diagnoses such as ADHD or Autism are neither advantages or disadvantages in life, they simply indicate that someone’s brain just works differently. This clip was taken from series 2, episode 10 of Destination Happiness.